ALL OVER THE U.S. at News Aboriginal Art Directory. 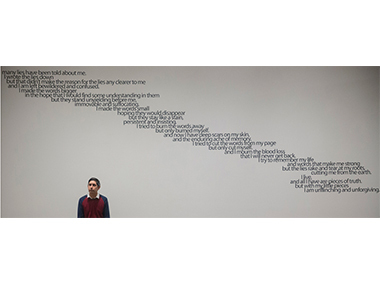 View information about ALL OVER THE U.S.
Dorothy Napangardi's 'Karntakurlangu Jukurrpa', (2002) in Harvard. Synthetic polymer paint on canvas. Collection of Margaret Levi and Robert Kaplan. © estate of the artist, licensed by Aboriginal Artists Agency Ltd.
Why is it so.....that there are more, and more considered exhibitions of Aboriginal art currently on in America than here in Australia? The recent pattern there of solid shows of collections like the Kaplan and Levi, Debra and Dennis Scholl's and Harvey Wagner and the late Will Owen's (who died on December 2nd 2015 after posting his last, as-ever well-informed commentary on November 15th) has suddenly been disrupted by last year's 'Abstraction and the Dreaming: Aboriginal Paintings from Australia’s Western Desert' at the Nora Eccles Harrison Museum of Art, Utah State University, and currently by a major outing of 70 Aboriginal artists at Harvard Art Museums (there are no less than three, now under one roof designed by Renzo Piano), and a solo show by the unbelievable, 105 year old Loongkoonan in Washington. And both are provoking the sort of serious reviewing that you virtually never find in Australia – outside AAD! This follows a trend set towards the end of last year by Warlimpirrnga Tjapaltjarri – one of the 'Last of the Nomads' - who had a solo selling show in New York that gathered masses of positive attention. What's got into the American water??? It's hard to be certain, but three factors seem to me to play into the story. For a start, there are two Aussie curators currently based in the US – Stephen Gilchrist at Harvard and Henry Skerritt in Pittsburgh, both of whom, quite logically, are on the look-out for opportunities to exercise their skills. And then there's Dennis Scholl, about whom I've written a fair bit. But his history as a serious trans-Atlantic Contemporary art collector gave him enormous credibility when he saw the light and began to collect Aboriginal art, declaring it was the finest abstract art he'd ever encountered. The tour of his so-far all-male collection is currently in Detroit, a year after opening in Nevada. A third factor is DFAT – Foreign Affairs (or is it Trade) are supporting both shows, presumably spurred by eager, committed curators and a museological mood which was open to both the aesthetics and politics of our Indigenous art. Since I haven't had the opportunity to be in either Cambridge or Washington, most of what I'll report from the two current shows will be via other peoples' words. But, just as Warlimpirrnga last December brought out the best in NY Times and Wall Street Journal critics, so have Loongkoonan and the 70 artists at Harvard Art Museum done so this time. "For a bit of fun." Harvard Art Museums time-lapse video of the installation of Vernon Ah Kee’s work 'many lies'. “When any compelling new way of picturing the world shivers into being, it can’t help but enthrall us. Think what it is like to see the early Cubist paintings by Braque and Picasso, or the very first sensationally realist, shadow-filled paintings of Caravaggio. Many may see 'Everywhen', a succinct survey of Australian Aboriginal art at the Harvard Art Museums, and feel similarly fascinated and awed”. Now this unfamiliarity with the art may be another factor in the liveliness of the American response to our art. But, in fact, this writer is none other than Sebastian Smee – Aussie expat, and chief art critic for The Boston Globe on Feb 4th, only simulating unfamiliarity. 'Everywhen' - the full title of the exhibition is 'The Eternal Present in Indigenous Art from Australia' - is a neologism for the more common English usage, The Dreaming, taken from the writings of the great anthropologist WEH Stanner, who said, “Everywhen is a kind of narrative of things that once happened; a kind of charter of things that still happened; and a kind of principle of order transcending everything significant for Aboriginal man”. Smee soon reveals himself: “If “Everywhen” is not quite the show of Aboriginal art I’ve always secretly longed to see, it is probably the best I’ve actually seen. (And as an Australian art critic, believe me, I’ve seen a few). In around 70 works, it provides a smooth and enlightening introduction to forms of art celebrated in their home country not only as beautiful, but salvific: the aesthetic equivalent of balm applied to shameful national wounds. Aboriginal art is perhaps best thought of as a political expression of cultural identity and resilience, and an ongoing quest for images of concentrated power and beauty”. Good stuff....which continues: “'Everywhen' includes a handful of early Papunya paintings and even earlier works on paper by such artists as Anatjari Tjakamarra, Uta Uta Tjangala, and the brilliant Mick Namarari Tjapaltjarri. In their fusing of rudimentary means with secret, inherited knowledge, there’s something magical about these pieces. Re Mick Namarari’s 'Big Cave Dreaming', the very act of painting the piece can be thought of as a performance, or the reiteration of a sacred action. That goes also for a lot of the larger, more visually immersive art that flourished in Indigenous communities across Australia in subsequent decades. “Aboriginal painting on canvas reached, in my opinion, an apogee of beauty in works by such artists as Turkey Tolson, Mick Namarari, Dorothy Napangardi, Kitty Kantilla, and more recently, Warlimpirrnga Tjapaltjarri. All these artists achieved subtle optical effects by painting closely repeating lines and dots in subtle colors without too much fastidiousness or predetermined designs. The resulting patterns suggest mythical “songlines” (mythological stories from the so-called 'Dreamtime' that relate to place and becoming), but also aerial views, Western contour maps, and, via their optical dazzle, desert haze. 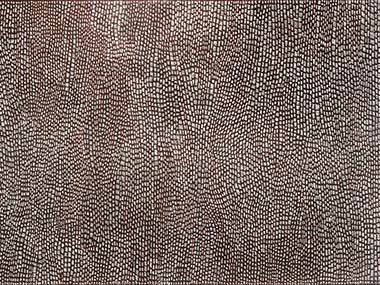 “The only work in 'Everywhen' that reaches these heights is Napangardi’s 'Karntakurlangu Jukurrpa', 2002. In hues of glinting bronze, the painting evokes rhythmic women’s ceremonies that relate to digging for sustenance, as well as the rocky terrain of the vast and spinifex-strewn Tanami desert. It seems to me a masterpiece, an austere yet shimmering thing that squirms with life, suggesting tremendous complexity within a deeper, inexpressible simplicity. There are especially fine paintings by Paddy Bedford, Ronnie Tjampitjinpa, Tommy Watson, Alec Mingelmanganu, Tutuma Tjapangati, and Regina Pilawuk Wilson. But what’s missing are genuinely high quality bark paintings by such artists as John Mawurndjul and others from Arnhemland. Mawurndjul, in particular, is a potent and innovative artist, who has long been acclaimed on the international stage”. 'Everywhen' has been curated around four interrelated themes - Seasonality, Transformation, Remembrance and Performance – rather than the catch-all divisions of urban and remote, traditional and contemporary that we tend to gravitate to in Australia. “In my experience, unfortunately, these labels short-circuit peoples engagement with Indigenous art and they don't have much currency in the US anyway, which is intensely liberating,” Gilchrist explained. “Many of the geographic markers that we use in Australia aren’t as well known either so I’ve hung works based on a thematic that explores the curatorial premise of time; I didn’t want the exhibition to endorse a simplistic urban versus remote divide,” he added. Gilchrist continued: “An exhibition of this scope has not been seen in the United States for more than 25 years, and it reflects the ways in which the art historical landscape has shifted since then. Indigenous art is no longer positioned as “other,” but as another form of contemporary art that demands our critical attention. This exhibition presents an opportunity to introduce audiences to the central role that Indigenous art plays in the global narrative of contemporary art”. Fortunately, Lee Lawrence in the Wall Street Journal was able to distinguish between artists and non-people: “One artist, however, stands out for her disinterest in all history, sacred or profane. Nyapanyapa Yunupingu (from Yirrkala in Arnhemland) seems to have always been more focused on form than meaning; she even titled a series 'Mayilimiriw', or 'Meaningless'. In her digital animation, 'Light painting' (2010-11), 110 drawings of figures, plants and patterns on acetate sheets are superimposed so that we see them three at a time. As one composite dissolves into the next, a new creation emerges— ironic that, of all the pieces, this one seems to most concretely express the everywhen in which past, present and future embrace in an eternal becoming”. The presence of the Peabody Museum artefacts involved Australia's Narayan Khandekar, formerly of the University of Melbourne, now heading the Harvard Art Museum's Straus Centre for Conservation and Technical Studies, where he is leading research on Aboriginal bark paintings. His research claims to contradict historical notions of whether Indigenous artists preserved their own work, rather than conservation only occurring once museums starting collecting them from the 1800s. For he has found evidence of orchid juices used to fix ochres on old barks. Oddly, I thought we always knew that plant extracts, turtle egg albumin and kangaroo blood were part of the pre-art market armoury for Aboriginal artists. 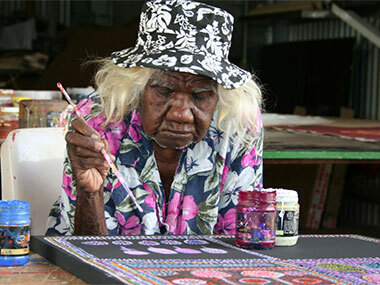 Meanwhile in Washington, the work of a little old lady from the distant Kimberley is causing delight: “Born around 1910, Loongkoonan is the oldest living Nyikina speaker and one of Australia’s oldest practising artists. A revered matriarch in her community, her life experiences inform Loongkoonan’s shimmering and delicate paintings of Nyikina country. “Covered in overlapping dots, they sparkle with a gentle melding of colour and form that perfectly balances delicacy with emotive urgency. In Loongkoonan’s paintings ‘bush tucker’ acts as a metonym for a lifetime’s accumulated knowledge and serves as a referent for a time when the hierarchies of Indigenous knowledge and learning were respected. Balancing nostalgia with an obvious joie de vivre, her works are defiant statements of the continuation of Indigenous culture”. This is the commentary of Emma-Kate Symons in the New York Times, who also explained that it took some encouragement from her niece Margaret to get the future artist painting in the Manambarra Aboriginal Artists Studio in Derby, WA in 2004. But Loongkoonan quickly attracted critical attention. At the age of 95, the budding artist embraced painting with such enthusiasm, confidence and dedication — producing an astonishing 380 works in just under five years — that her very first work titled 'Nyikina Country' caught the eye of Perth art dealers Diane and Dan Mossenson. They have lent all the works in the current exhibition in a situation not unlike Loongkoonan's neighbouring tribesman, the Andinyin man, Ngarra – also a protege of the Mossensons. Ngarra was very big at Adelaide's recent Tarnanthi Festival; Loongkoonan will feature in the imminent Adelaide Biennial. In the words of the lady herself: “I am Loongkoonan and I am an elder of the Nyikina people. I am proper Nyikina, one of the Yimadoowarra or riverside people – the name fo the show. I am only Nyikina, not mixed up with anything else. My grandfather was proper Nyikina too. I was born at Mount Anderson Station near the Fitzroy River. When I was born, no one worried much about recording the births and deaths of Indigenous people, or teaching us to read or write. Research by my niece Margaret suggests that I am aged in my late 90s, but I am still very lively. “Footwalking is the only proper way to learn about country, and remember it. That is how I got to know all of the bush tucker and medicine. Nowadays I show young people how to live off the Country, and how to gather spinifex wax, which is our traditional glue for fixing stone points to spear shafts, patching coolamons, and making all kinds of things. Nyikina spinifex wax is really strong. It was so well known in the olden days that it was traded all over the Kimberley and desert. I had a good life on the stations and three husbands. Today I am a single woman, and I still enjoy footwalking my country, showing the young people to chase barni (goannas) and catch fish. In my paintings I show all types of bush tucker – good tucker, that we lived off in the bush. I paint Nyikina country the same way eagles see country when they are high up in the sky”.